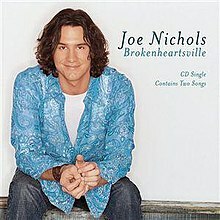 "Can't Hold a Halo to You"
(2002) "She Only Smokes When She Drinks"
"Brokenheartsville" is a song written by Donny Kees, Blake Mevis, Randy Boudreaux and Clint Daniels and recorded by American country music singer Joe Nichols. It was released in November 2002 as the second single from his 2002 album Man with a Memory. The song became Nichols' first member one hit on the U.S. Billboard Hot Country Singles & Tracks (now Hot Country Songs) chart and earned him his second consecutive Grammy nomination for Best Male Country Vocal Performance. The song also was later covered by Johnny Rodriguez on his 2011 album Live from Texas. The song deals with a man who has had his woman stolen from him and him drinking at a bar "down in Brokenheartsville." Wade Jessen of Billboard called the song a "beer-can-crushing, honky-tonk lament of lost love." The video starts out with Nichols drinking at an official bar in the city, and talking to his friends. He was also watching a singer sing live on stage. This video was directed by Trey Fanjoy. In the second verse, when the singer is done on stage, Nichols takes the stage and sings his song. The video was filmed in downtown Nashville, Tennessee and the outside shots of the car were filmed near the Bridgestone Arena. "Brokenheartsville" debuted at No. 56 on the U.S. Billboard Hot Country Singles & Tracks chart for the week of November 2, 2002. The song spent 31 weeks on the chart, reaching number one for the week ending March 29, 2003, where it remained at the top spot for one week. ^ a b Whitburn, Joel (2008). Hot Country Songs 1944 to 2008. Record Research, Inc. p. 299. ISBN 0-89820-177-2. ^ Randall, Alice; Carter Little; Courtney Little (2006). My Country Roots: The Ultimate MP3 Guide to America's Original Outsider Music. Thomas Nelson, Inc. p. 92. ISBN 1-59555-860-8. ^ "Joe Nichols Chart History (Hot 100)". Billboard. Retrieved February 8, 2011. ^ "Joe Nichols Chart History (Hot Country Songs)". Billboard. Retrieved February 8, 2011. This page was last edited on 20 November 2018, at 21:48 (UTC).